GROW YOUR OWN | A Continuous Lean. We normally steer clear of politics, but when two brands that we respect the hell out of are backing an initiative that could have a lasting and positive impact on the American farmer, we’ll happily enter the fray. The issue at hand is hemp. This year, on July 4th, 2016 a petition will be delivered to congress in support of the Industrial Hemp Farming Act which would make it legal for American farmers to grow and harvest hemp. It’s a game-changer that could shift the production of this lucrative material from overseas farms to the United States, providing a significant boost for small, sustainable farming. Photo by Mikael Kennedy. Modeling by Mr. Cold Splinters. Hemp is a fiber that has been erroneously lumped in with marijuana under The Controlled Substances Act and, as a result, has been deemed illegal to harvest in the United States for decades. As a result, America has relied heavily on China for hemp production – an estimated 500 million dollars worth in 2016 alone. This is a missed opportunity for American agriculture as hemp is an ideal fiber crop. It is drought tolerant and requires little to no irrigation. It does not need pesticides or synthetic fertilizers to flourish and it’s harvested and processed by hand which reduces fossil fuel use. It naturally remediates the soil, meaning it doesn’t strip the land of its nutrients after harvest. Most importantly, it’s a new farming enterprise in the U.S. that could potentially create tens of thousands of jobs and a domestic pipeline for brands that want to work with the textile in their product line. Patagonia is one of the most notable brands who are backing the movement. They already use high-quality Chinese-grown hemp in some of their clothing, utilizing its breathability, durability and performance. 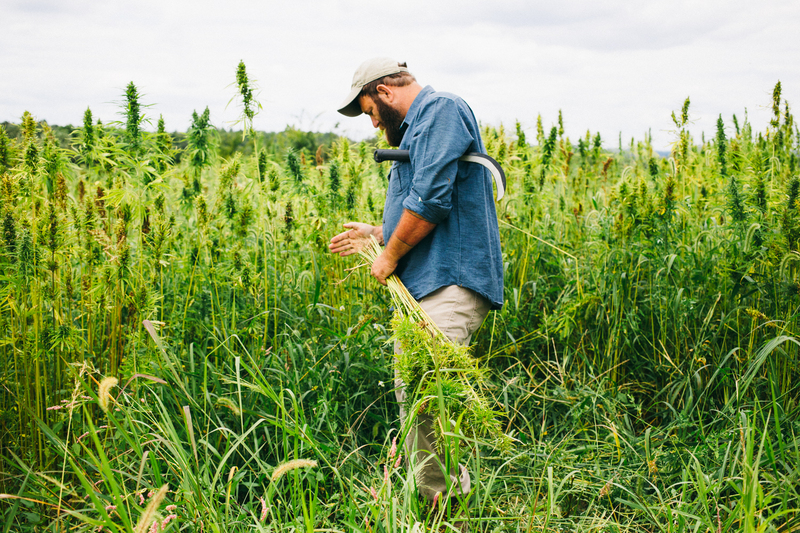 They believe in hemp’s potential and are pushing to see production move stateside. So much so, that they sent their own ambassador – pro surfer, farmer and filmmaker Dan Malloy – out on the road to make the above film Harvesting Liberty. 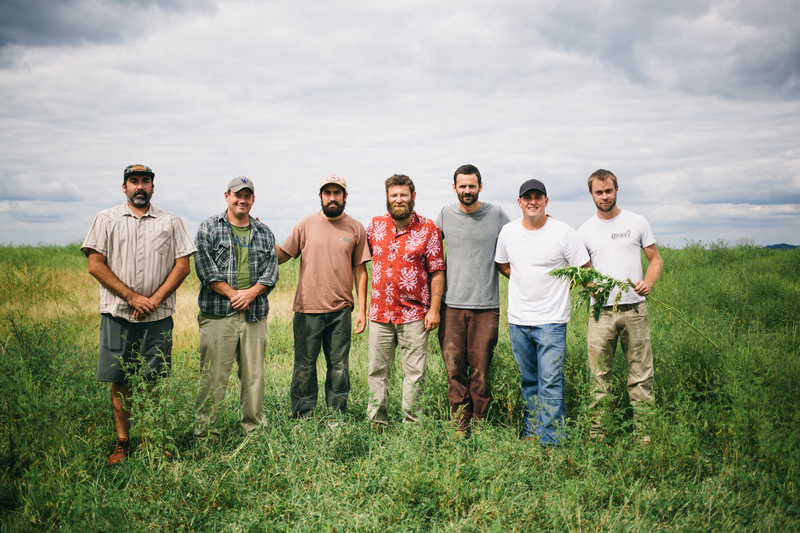 It’s the story of a small family farm in Kentucky run by U.S. Veteran Michael Lewis, a member of The Growing Warriors Project. It documents his own journey to bring hemp farming to his home state, in the process offering stability and opportunity for other vets. Growing Warriors. Photo by Donnie Hedden. Los Angeles based Jungmaven is also getting involved in the cause with its upcoming launch of “Legalize Hemp” tees in support of the initiative and have gone all in with the brand tagline, â€œEveryone In a Hemp Tee by 2020â€. While this might sound overly optimistic, the superior product that Jungmaven puts out could be the key to converting the masses. Much of the current line-up of basics and pocket tees use either 100% hemp or a hemp / organic cotton blend. The Jungmaven 7 oz. 55 / 45 blend pocket tee shirts are my favorite shirts currently in the marketplace. They are long-lasting (I get years and years of wear per shirt), they hold their shape and the texture and color is perfection. The bonus is that the shirts are all made here. Hopefully one day soon Jungmaven can source its hemp from around the U.S., not from around the world. You can back the Industrial Hemp Farming Act sign the petition here. It is beyond me how this very useful fiber is still illegal in America. Every politician that is still for the ban on hemp should try and smoke some. The lack of a perceptible high will change a lot of people’s opinions on this matter. Thank you for contacting me regarding proposals to decriminalize hemp cultivation in the United States. I appreciate having the benefit of your views on this matter. While I recognize that hemp varieties were once common in American agriculture, and that imported hemp fiber and by-products still serve a number of legitimate commercial purposes, I share the concern of the U.S. Drug Enforcement Agency that decriminalizing hemp farming could increase the incidence of illicit marijuana cultivation and complicate federal surveillance and enforcement measures. However, you may be certain that I will keep your views in mind should relevant legislation be considered during the 114th Congress. I appreciate the opportunity to represent Texas in the United States Senate. Thank you for taking the time to contact me. Due to the nature of electronic communication, if you did not receive this e-mail directly from my office, I cannot guarantee that the text has not been altered. If you have questions about the validity of this message, or would like to respond to this message, please use the web form available at my website, http://www.cornyn.senate.gov/contact.